Home » Forums » Public Access » Chit Chat » Whats your Computer History? Well I have been reading up on Computers and was wondering how many PC's you lot have been through, What you have learnt and Whats good and whats not so good. My Computer History is very boring, I have never actacly owned a PC, but use the family one all the time. I am saving up, so fingers crossed someday I will have my own! ASUS A6Jm Intel Core Duo 1,83 GHz, 3GB RAM (2006). A close friend of the family I think it was, so like "My son is doing so good since I got him a computer, you should get yours one to"
So my mom spent $800 to get my brother a Tandy 1000 at Radio Shack. 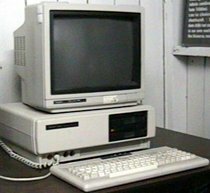 Which had an Intel 8088, MS-DOS 2.0 bundled with Deskmate. Dot matrix printer and a joystick that is more like the 'pointer' stick on some Laptops today. And one 5 1/4 inch floppy drive which we never learned you could 'cheat' into making dual layer. He never used th e bloody thing !!! But I did xD, before I could read I was playing games on it and in kindergarden through like first grade doing educational games on it. In the late 1990's we got a WebTV (my brother wanted one) so we gained Internet Access. Later on after he moved out we got a WebTV Plus iirc. Some one that goes to our Church does stuff with computers and his parents give old machines to him when they can't use them in classes any more, so he refurbishes them and gives them out. When it finally died by way of a Hard Drive Controller cook-off. Our Pastor who was upgrading his office PC gave us his old Packered Bell. With a lovely Pentium II @ 233Mhz, 64MB of RAM!!! And about a 2GB hard drive dual-booted between MS-DOS (barf) and Windows 98. Both had a CD-ROM and Floppy drive but I could never find any 3 1/2 inch disks!!! I had collected some as a kid though. For me they were 'hard disks' compared to the 5 1/4 floppies I grew up with. It was on these machines that I 'poked' around Windows looking at every bit of information II could find. But I dared not change any thing because if I broke it ma would kill me xD. After Windows 'ate' it self, my brother decided it was time to get serious. So he bought ma a Dell 4550, almost the same PC he had: Pentium 4 2.0Ghz, 256MB RAM, 120GB HDD with Windows XP Home and a 32MB ATI Gfx card (we would later get his upgraded sound card, 256MB more RAM, and 2*gfx cards ) and ma paid him back so much per month. Some years later we would upgrade from Dial Up to aDSL and I would take up RvS along side MW4 as my hobby hehe. Around November 2005 I had started learning C++ Programming, I don't really know why loool. I think I had wanted to try and take things to the next level. Some months later a friend showed me ESR's page on How to become a Hacker and that led me to the Unix and Internet Fundamentals HOWTO. I fell in love instantly, read the entire thing over night... I had to learn more about computer internals. i studied UNIX and Computer history by grep'ing the Web for information, the history of the old style computing at Bell Labs and MIT's AI Lab, the LISP machines and things really struck a cord. So putting my toe in the pond, I searched out what a Unix like system would look like at the 'Desktop' level, to compare to Windows. I had often wished as a gamer that I knew some one with Linux, because I thought it must cost 10*more then Windows since it was so rare for games to support it (most Linux and BSD OSes are totally free). The only problem was my mother would not let me repartition her PC.... So I began planning to build my own PC, in the hopes some day I could afford to. When we started to work for a couple around January 2006, the Husband (an IT man) found out about it and gave me one of the old computers he had so I could install Linux or BSD and learn at home. An old HP Vli8 Desktop with a Pentium III 500Mhz, 384MB RAM, 8MB onboard Matrox Gfx card, and a small 8GB Maxtor hard drive that I nearly blew up. He even threw in the keyboard and an old 19" Monitor! Ma bought me the mouse and Desk. I shrunk the installed Windows XP Pro down to the minimal ~1.5GB and installed FreeBSD 6-Release at 4AM in the morning. Fragged it, installed PC-BSD which I had been following for some time. The system worked great and I learned a lot quickly. Just over a year ago, we found out that we had an Insurance check coming from when my Grand Mother died, about 9 years before. Ma wanted to split it with both us boys, I offered to refuse it and Reese turned it down. She was willing to g ive me $1500 for a PC. I wanted to build my own, she freaked. My Brother raised hell so I shut them both up by buying this computer: Pentium D 930 (3.0Ghz * 2 core), 2GB RAM, 256MB Gfx card + TV Tuner, 500GB HDD, and Windows XP MCE. It became my test machine running PC-BSD while I used the HP as a headless machine via VNC. I couldn't get work done, so after my mom started paying me. I asked my brother to order me a dirt-cheap Dell Laptop, he refused "You don't need a laptop! "; good thing to because my mom couldn't afford to pay me after a few weeks lol. My Sister (in-law) bought me a Toshiba laptop for $750 before going on vacation so I could 'get away' and code. We had came in looking for a $500 HP on sale, which they sold out before printing the ad ^_^. It didn't work with FreeBSD at all so I had to send it back, pay a $100 restocking fee!!! And bought a ~$600 Gateway and it worked GREAT. Mean while I dream of building a New PC my self but can't afford it No more then I can afford to build my ultimate dream machine, "Esmeralda" with 5 monitors and a heck of a lot more xD. Wish if I could I would machine the case myself and try to find a workstation or server grade mobo to build off.... but that is beyond me both in shop-class skills and $$$. This gives me currently 5 PC's, Moms Desktop, My Desktop, the PC I am fixing, My File Server, and my Darling Laptop Dixie :-). And about 9 computers that we've owned since some time in the 1980's. If I could, I would own a house full. I think it was 1998 when I bought my first real PC, a Pentium II 400, 32 MB graphic, 512 MB RAM. The last and still in use PC dates back to 12/2004 and is an AMD64 3200, 128 MB graphic, 1.024 MB RAM. Um....My first home (not mine) computer was a Macintosh I think...I used to play some sort of maze game if I remember right. Second family computer-P2, Windows 98 at first...Windows2000, WindowsME, then finally WindowsXP...and it still works fine. later I had a Atari ST and my first real PC was a Athlon 800 in 1999. 2 PCs later I have my actual system - voila! Amstrad CPC 464 with a green screen and tape deck which took 5 mins to load up! Rememeber Dizzy anyone??? my own AMD 3d NOW 800mhz with 512mb and voodoo 3 LOVED IT! Im not telling you how far i go back here, but yes i did have one of those. I dont feel so good, when people say there first computer had a pentium chip in it. Even after i finished my computer courses, pentium was just a rumour. Yeah, before monitors they used to use TTY's like this baby. The original default text editor on Unix has a feel of being designed for a typewriter, because that is basically the kind of 'window' it ran in before CRT's hehehe. Whats my computer history? Welp I got this computer and now it is History,lol, Good read there Spidey, man that was alot of typin ya got there. I don't have alot of history with computers, most of mine is in pitchin and flippin, Some crank baitin thrown in along with a bit of top water too.lol. I am still learnin on these computers, alot of fun but can be testy at times, Then I hollar for Jb to come over and put his wonder touch on it and bring it back to life for me. This is my new setup i did every year of pentium and 486 i still have the computer too. I remember my last typewriter and my first computer. The latter had a 20Mb HDD, and I remember the salesman talked about how many documents I could store inside the box. This was late in the eighties.